This week there’s exciting news for car buyers at Imperial Car Supermarkets! In order to give you even more peace of mind when buying a used car from us, we are now offering RAC warranties. With a comprehensive warranty from a name you can trust, you can drive away without the worry of big repair bills in the future, it could even save you hundreds or thousands of pounds. As an RAC Approved Dealer all our cars (with the exception of outlet cars) are already inspected by an RAC engineer, given an RAC inspection report, top quality cosmetic refurbishment and a full valet before being put on sale. However, as all cars get older, the risk of breakdown or mechanical problems inevitably increase. By adding a comprehensive RAC warranty to your purchase, you can protect yourself against many mechanical or electrical faults in the future. 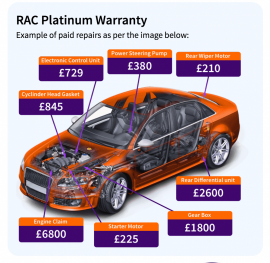 You might be surprised how much is covered by an RAC warranty, such as key fobs and key cards (up to a maximum of £100 per repair request), factory fitted air conditioning/climate control, in-car entertainment, convertible roofs and much more. At Imperial Car Supermarkets, we know that car ownership can be expensive. Rising insurance costs and fuel prices along with maintenance and repair costs can require a sudden unexpected payment. We want to help keep you on the road, so why not come and read more about an RAC Warranty or make a warranty enquiry to find out more.